In a call center, the supervisor's job is responsible for the daily work of the agents in his group, guidance and supervision and to generate statistical reports. 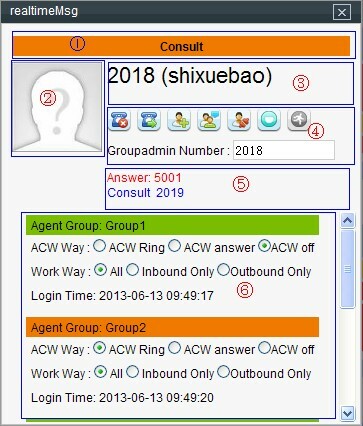 Forced release : Group admin will talk to the customer instead of agent, agent will hang up. Forced pause : Change agent status to “Pause”, agent would not receive any calls from the queue. Forced idle : Change agent status to “Idle”, agent would start receive calls from the queue. Forced logoff : Log off the agent from a queue. To use Spy、Call Barge、Whisper、Force release , by default, it will use the extension number of the group admin.